One of the biggest Second Amendment court victories ever was recently won in California, and the National Rifle Association was there every step of the way. The decision of the 9th U.S. Circuit Court of Appeals in Peruta v. County of San Diego upholds the right to bear arms for the 38 million law-abiding citizens of California. In fact, the victory was so big that extremely anti-gun California Attorney General Kamala Harris and some gun-ban groups have mounted an enormous effort to get the Peruta case overturned. So far, they have succeeded in blocking—at least temporarily—the court’s ruling that carry rights must be respected. The Peruta holding says that typical, law-abiding Californians should be able to obtain permits to carry handguns for lawful protection—as people in the vast majority of other states already can obtain permits. Because the 9th Circuit also includes Hawaii, the right to carry would be protected there, too. Right to carry has been long established in the remaining states in the 9th Circuit: Alaska, Washington, Oregon, Idaho, Montana, Nevada and Arizona. As I’ll explain, the final outcome of the Peruta litigation is up in the air as this article goes to press. But there’s no doubt that the 9th Circuit’s Feb. 14 decision in favor of the right to carry was a major victory that gun prohibitionists are working frantically to overturn. Let’s take a look at the ingredients that led to the success so far. A good first step in winning litigation is to identify plaintiffs who have compelling stories to tell. In the Peruta case, one of the plaintiffs is Mark Cleary, a registered nurse at a California lockdown facility for persons who have been found to be legally insane. While the vast majority of mentally ill people are not violent, a small but dangerous subset are violent. Cleary has received several death threats, which have been documented by the police. Another plaintiff is 26-year-old Michelle Laxson, who runs her own hairdressing business. She sometimes has to carry large sums of cash through dangerous neighborhoods at night. Cleary and Laxson were denied carry permits by the San Diego Sheriff. Plaintiffs such as these help judges understand the real-world problems caused by excessive gun control. It is also important to include a variety of plaintiffs, in case unexpected procedural problems arise. Federal courts these days are very strict on the doctrine of “standing,” which significantly limits who is allowed to bring claims in a federal court. Many federal plaintiffs who had powerful legal claims on the merits never got a decision on the merits because a court determined that the plaintiffs lacked standing to sue. To help guard against this possibility, another plaintiff in the Peruta case was the California Rifle and Pistol Association Foundation. The Foundation has legal standing to represent the interests of its members, and this provided a strong back-up in case standing problems developed with any of the individual plaintiffs. Civil rights litigation often takes a long time, and the Peruta case, which began in 2009, was no exception. Money doesn’t grow on trees—even in California—and Michel can’t expect his staff to work for free. And none of the plaintiffs had enough money to pay for thousands of hours of attorney fees. So the NRA stepped in, providing the necessary financial support for the case. Like other attorneys who have worked with NRA over the years, Michel & Associates sharply discounted their standard billing rates because they recognize that the NRA, too, has limited resources. There was one more ingredient also essential for success—bringing a focused legal challenge on the most consequential part of the law, and not trying to resolve every injustice in one case. “What part of ‘shall not be infringed’ don’t you understand?” may sound great on a bumper sticker, but it’s a guaranteed loser in court. The vast majority of judges are reluctant to overturn a state statute. It is much easier to convince a judge to adopt a particular interpretation of a statute than to get the judge to throw the statute out entirely. So the Peruta lawyers took the approach that had the best chance of winning. On paper, this might not sound unreasonable. The possibility that any judge in 2014 was going to find these requirements to be “unconstitutional” was unlikely, to say the least. In some California counties, such as Sacramento, sheriffs were applying the state statute in a reasonable manner. If an applicant had appropriate safety training, passed a fingerprint-based background check, and had no other problems, then the applicant would be issued a carry permit. The “good cause” requirement was satisfied by the applicant’s wish to carry a concealed handgun for lawful self-defense. But in San Diego County—and many other California counties—the state statute was not applied in a reasonable way. “Good cause” was interpreted to mean “compelling need.” The only people who could show “compelling need” were victims of specific known threats from particular violent criminals. And even then, a permit might not be issued. The Peruta lawyers did not challenge the statutory “good cause” requirement. Instead, they simply argued that “good cause” must be interpreted Sacramento-style rather than San Diego-style. The opinion was written by Judge Diarmuid F. O’Scannlain (a 1986 appointee of President Ronald Reagan), and joined by Judge Consuelo Maria Callahan (a 2003 appointee of President George W. Bush). Voting against carry rights was Judge Sidney R. Thomas (a 1995 appointee of President Bill Clinton). Thomas was a finalist for the U.S. Supreme Court vacancy that President Barack Obama eventually gave to Elena Kagan. The 2-1 vote thus illustrates another essential requirement for success in the courts—success on election day. If you want federal judges who believe that the Second Amendment deserves just as much protection as any other part of the Constitution, you need to elect presidents who will appoint such judges, and senators who will confirm them. The NRA grassroots volunteers who helped elect Ronald Reagan, George W. Bush and pro-rights senators over the years deserve much credit for the 2014 win in Peruta. The Peruta decision holds that a government may specify what mode of carrying to allow (open or concealed), but a government may not make it impossible for typical citizens to exercise their Second Amendment right to bear arms. Does the conduct at issue involve Second Amendment rights? If so, then the court must apply “heightened scrutiny” (that is, the court must decide if government has carried the burden of proving the constitutionality of the restriction on the right). However, if the law destroys the right, rather than merely restricts it, then the law is categorically unconstitutional, with no need for detailed analysis under heightened scrutiny. The details of the two parts of the test vary among the federal circuit courts, and not all circuits recognize the final item in step 2—that a law can be categorically unconstitutional. The Peruta decision examined the text of the Second Amendment, the Supreme Court decisions in Heller and McDonald, and the legal history of the right to bear arms. The 9th Circuit paid particular attention to the historical cases and legal commentators that were favorably cited by Heller and McDonald. The analysis straightforwardly showed that the right to carry a gun in public places for lawful self-defense is part of the Second Amendment right. So the plaintiffs passed step 1 of the two-part test. Hence, San Diego’s policy is unconstitutional. As a result, the Illinois legislature in 2013 enacted a “Shall Issue” Right-to-Carry statute. The new statute is not perfect, but it is a huge improvement for Second Amendment rights in the heartland. In the Northeast, judicial results have been just the opposite. Challenges to hyper-restrictive carry licensing in New York, New Jersey and Maryland have resulted in decisions by the 2nd, 3rd and 4th Circuit Courts of Appeals, all upholding the restrictive laws. The Peruta opinion devoted several pages to explaining why these northeastern courts were legally incorrect. Among other reasons, the northeastern cases cite and rely on prior cases that themselves were incorrect, according to the Supreme Court. For example, the 1876 Arkansas case Fife v. State had said that the right to keep and bear arms is only about the militia. In 2008, the U.S. Supreme Court in District of Columbia v. Heller ruled that the Second Amendment is not militia-only. The Supreme Court reiterated this point in McDonald v. Chicago in 2010. Yet in 2012, the 2nd Circuit upheld New York’s extremely restrictive gun licensing, in Kachalsky v. County of Westchester. The 2nd Circuit cited the 1876 Fife case as a supportive precedent. As the Peruta decision makes clear, courts that refuse to recognize a meaningful right to bear arms are really just refusing to follow the Supreme Court’s teachings in Heller and McDonald. What’s next? San Diego Sheriff William Gore said that he would start issuing carry permits in compliance with the Peruta decision. But California Attorney General Harris has chosen to put up an all-out fight. 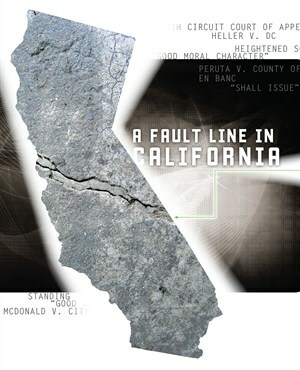 Because the case involved the interpretation of a California state statute, the attorney general had a legal right to participate in the case from the beginning. Harris did not do so, but now has filed a motion to intervene in the case, and thus become a party. Along with the motion to intervene, the attorney general also has asked that the 9th Circuit rehear the case en banc. Cases that come before a federal Circuit Court of Appeals are decided by a panel consisting of three judges from that circuit. In an en banc rehearing, the entire set of judges from that circuit hears the case. That means that Peruta could be heard before a tribunal consisting of all 27 judges on the 9th Circuit. Because the 9th Circuit is so big, however, the court usually picks just 11 judges for an en banc rehearing. Circuit courts have complete discretion about whether to hear a case en banc. All the judges of the circuit vote whether to grant an en banc rehearing. A simple majority of judges on the circuit is enough to grant an en banc. En banc rehearings are rare and granted only in cases of exceptional importance. Along with the attorney general, two gun prohibition groups filed briefs asking the 9th Circuit for an en banc rehearing—the Brady Center to Prevent Gun Violence, and the Law Center to Prevent Gun Violence (an organization of anti-gun lawyers). Only one sheriff (Robert Doyle of Marin County) joined the anti-gun briefs. Also, two law-enforcement groups joined the briefs: the California Peace Officers Association (a self-described “progressive” organization with about 3,000 members) and the California Police Chiefs Association (that is, political appointees of anti-gun mayors). The heavyweight corporate law firms of Covington & Burling and Hogan Lovells helped write the anti-gun briefs. Predictably, the briefs were filled with hysterical and illogical arguments. They brought up the Tucson shooting of Congresswoman Gabrielle Giffords and the Aurora, Colo., theater shooting, even though neither perpetrator had a carry permit. The 9th Circuit has not, as of this writing, made a decision for en banc rehearing, but the three-judge panel did issue a stay of its mandate. In other words, the binding legal effect of the Peruta decision was put on hold while the 9th Circuit decides what it wants to do next. If an en banc hearing is granted, then the loser could appeal the case to the Supreme Court. The Supreme Court would have complete discretion on whether to take the case, and it’s impossible to predict what the high court would do. Undoubtedly, Attorney General Harris and her gun-prohibition allies are hoping that since a solid majority of judges on the 9th Circuit were appointed by anti-gun presidents, the anti-rights side can win the en banc, and then they can cross their fingers that the Supreme Court does not get involved. The victory in Peruta—and the risk of a loss en banc—both teach the same lesson for supporters of constitutional rights: Get involved in the 2014 elections and help elect pro-rights senators who will reject President Obama’s efforts to stack the federal courts with opponents of the Second Amendment.